Description: MISSES' DRESS: Pullover dresses A, B in two lengths have bodice front and back gathers, self-faced neck band and flared skirt. A: length is mid-knee. B: length is mid-calf. The dress is designed for 2-way stretch fabric. Pattern Sizing: Combinations: BB(8-10-12-14), F5(16-18-20-22-24). I cut a size 10 and I am happy with the fit. Instructions: The instructions were very easy to follow. The gathers were easy to sew and really set off the bodice. Fabric: A knit from a local sewing machine dealer. I just found out she is carrying pre-cut knits, not very many but I found this wonderful blue at her shop on Thursday. The only problem with the pre-cut fabric is I ran a bit short for the front band lining. In the end, I had to piece this section. Changes: I added 1" to the bodice front and back. Conclusion: We just came back from a short vacation and will be heading to the beach at the end of this month. I noticed several cute dresses on vacation and thought I would like a knit one for our next trip. The bodice and empire waist, I really like. Not sure the flared skirt is for me. I will wear it a couple of times and see. I can always take it in or make the dress into a top. 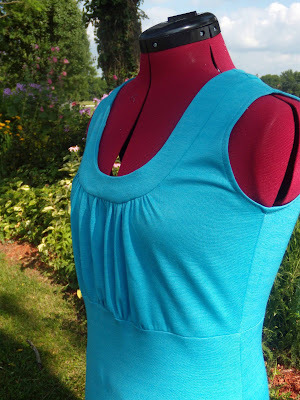 This dress is super easy to make but I think the design speaks "wow!" 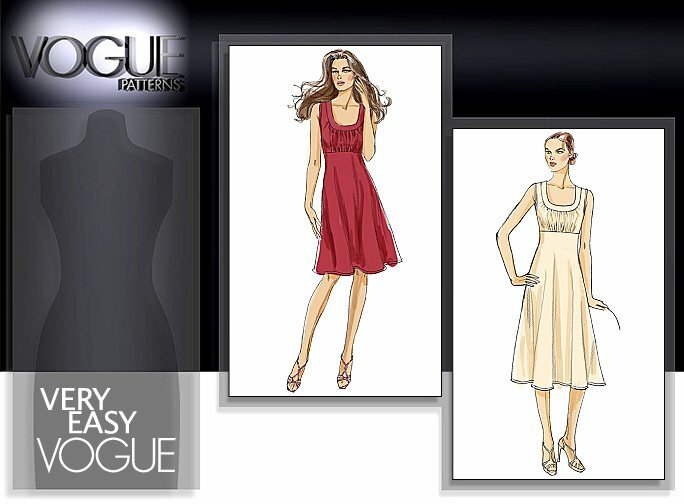 So if you need a quick dress for a summer event, try this pattern. Very pretty dress! Good job! Great dress! The color is perfect fro the style. I would to see it on you. However, the garden shots are really nice, too. I'm so happy you made and reviewed this. I'm a novice sewer and I had added this to my want list based on its Very Easy status. I was worried it wouldn't look as good in reality as it did in the picture, but yours looks adorable. Such a pretty dress and in my favourite colour too. How did you know? It's a bit cold at the moment to wear it but....ohhhh, the dress is for you. ;) Rats! LOL. Enjoy your vacation, Lori. Pretty dress, I'm sure you will enjoy wearing it. Love the fabric and the dress. I have this half cut out and stuffed somewhere. I started it right before the wedding and when I was cleaning (and in some cases stuffing things in cabinets) I put this somewhere. Seeing your version reminded me I've got it somewhere. I like the design of this dress. The gathers, front and back are very fashionable, with that "baby doll" look. Beautiful color. Enjoy wearing it. Pre-cut knits? What does that mean? At any rate, I love this dress and bet it looks great on you. fell in love with this pattern as soon as it saw it. just wish it came in my size. may have to hack an ottobre to make it work. a knit dress is a lovely thing to bring on vacation. This is just gorgeous. I'll bet it will look great on. That dress is beautiful. You did a lovely job on it. It's a great color for this summer. That's the perfect vacation dress and in my favorite summer color too! I love the style! Could I doll it up to make a summer wedding dress? Vivian, it would make a perfect summer wedding dress. I wore this one to a wedding.